Accepting credit card deposits for events requires compliance with both card not present and stored card rules. Not PCI Compliance rules for data security, but rather authorization rules set by Visa, MasterCard etc. Comply with the rules and get rewarded with more authorization approvals, qualify for lower rates and mitigate risk of chargebacks. Professionalism starts on the phone and continues throughout the buying experience. By replacing traditional credit card authorization forms with technology that puts buyers in control of their cardholder data, merchants create a better buying experience. Traditional credit card authorization forms were created to establish a record to use in the event of a future dispute. They’re useless today. Merchants must replace credit card authorization forms with technology compliant with new rules for storing and using stored cards. The initial authorization authenticates the cardholder. The initial authorization informs that the cardholder has agreed to merchant storing card. The transaction type will indicate it’s an estimate. Future authorizations will reference any required above items and be submitted as Incremental or Final. Compliance with the above is not possible with desktop terminals and even most virtual terminals and payment gateways. Merchants need a virtual terminal and or payment gateway that supports Unscheduled Credential On File, Incremental and Final Authorization rules. This is new terminology and new fields in the transaction process. Our solutions reduce buyer friction to pay and enables event sales and back office staff to collect deposits and capture cardholder data via text or email. These include push out payment requests via text or email, capture cardholder data for later use, and upload an invoice to collect payment. Click here to see one of multiple options available. Reduced merchant fees even with the same merchant account. Increased approvals with cardholder authentication. Mitigate chargeback risk including fraud liability shifting to issuer. More convenient for buyers- 24/7 payments on their schedule, not yours. 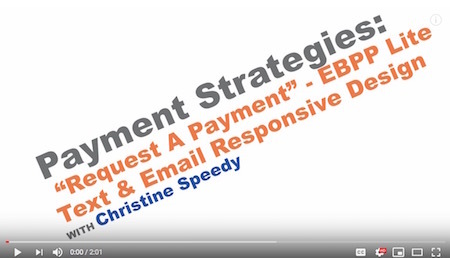 Call Christine Speedy, PCI Council QIR certified, for simple solutions to card not present payment transaction problems, 954-942-0483, 9-5 ET. The cloud technology you need today to accept all payment types, with optional merchant, check processing and other services. What Is Auth Code 05 decline? A credit card Authorization Response Code 05 decline transaction, or Do Not Honor, is card issuer response. What can the merchant do? In the above example, we can see that the AVS, ZIP and CVV were not validated as OK in the transaction authorization request. 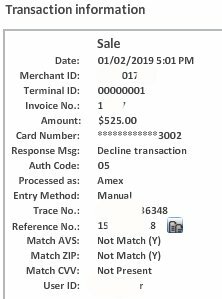 As this is a card not present sale manually entered by the merchant, failure to validate the security code is reason enough for an issuer to decline to accept the risk of potential chargeback. Merchants can avoid the scenario by using an even stronger cardholder authentication using 3-D secure protocols such as with Verified by Visa. For example, instead of key entering, require the cardholder self-enter their cardholder data. With the stronger authentication, merchants can expect more approvals, reduced fees, and chargeback risk shifted to the issuer. Asking the cardholder to call the issuer and request they approve the transaction is not a best practice and won’t provide the highest level of fraud protection. Call Christine Speedy, PCI Council QIR certified, for simple solutions to complex payment transaction problems, 954-942-0483, 9-5 ET. Level 3 processing requires payment solutions that can both send level data and dynamically optimize transactions to qualify for level 3 rates. Learn the secrets to higher profits right now. Were you told your last solution would fix your problems so you’d qualify properly? Have you been told with more training you could fix the problems to hit level 3? Hogwash! It’s not your fault, you just didn’t have an insider perspective until now. Many payment gateways can send level 3 data, but the requirements to qualify for level III interchange rates are much more complicated than that. Do you perform preauthorizations? You know what happens when the preauth expires? Or when the final settlement is not the same as the preauthorization? These are just two of many reason merchants fail to qualify for level 3. New rules for storing cards and using stored cards can also impact profits. Hint: If you haven’t made big changes to how you do this since October 2017, you’ve got a problem. Failure to comply with any rules negates rate qualification. If issuers are not sophisticated enough to catch all the rule breakers now, it’s only a matter of time. In the future, cardholders will be able to login to their bank and view all the companies that are storing their cards. So if you haven’t made the changes needed per new stored card requirements, including the new Unscheduled Credential On File (UCOF) transaction indicator, that creates a problem for the long term goals in financial industry. Compliance enforcement can include penalties and assessments. I’ve seen demo’s, heard sales pitches, and read the documentation on many payment gateways and virtual terminals. It’s not what’s there, but what’s not there that is most revealing. Before choosing a level 3 processing solution, get a demo. If you’ll be using a virtual terminal, use that for the demo. If you’ll be using an integrated solution, view the integrated solution demo. Store a regular card and business card. What methods are used to capture the initial card data? Then charge each card. Note the steps for each. How does the solution manage reversals on preauthorizations? What’s the process to identify and renew an expired authorization? How can buyer complete a transaction with 3-D Secure? Pull report to retrieve transaction. Pull report with level 3 data. Ask if the gateway supports Recurring, Installment, or UCOF depending on your needs; virtually all support Recurring, but not the others. Note how much of the process is automated, how much relies on people making decisions, and if any items are not available. Take screenshots. On a Mac it’s command + shift+ 4. Want a payments expert as a silent observer? Ask me to sit in on the call for unbiased feedback. Call Christine Speedy, PCI Council QIR certified, for simple solutions to complex payment transaction problems, 954-942-0483, 9-5 ET. CenPOS authorized reseller based out of South Florida and NY. CenPOS is an integrated commerce technology platform driving innovative, omnichannel solutions tailored to meet a merchant’s market needs. Providing a single point of integration, the CenPOS platform combines payment, commerce and value-added functionality enabling merchants to transform their commerce experience, eliminate the need to manage complex integrations, reduce the burden of accepting payments and create deeper customer relationships. Can I charge a credit card convenience fee? Credit card convenience fees 2018 rules explained. What’s a convenience fee and when can I use it? Convenience fees can only be charged for a bona fide convenience in the form of an alternative payment channel outside the Merchant’s customary payment channels and not charged solely for the acceptance of a Card. If a merchant only accepts credit cards, it’s prohibited. Alternatively as an example, if a merchant gets 99% checks in the mail, ACH, and wire, they could be eligible to charge a convenience fee. Who can and cannot charge a convenience fee? Environment, cannot charge a convenience fee. Convenience fee can only be charged by the merchant that provides the goods or services to the cardholder, not a third party. Cannot be charged on a Recurring Transaction or an Installment Transaction. Must be listed as a separate line item on the receipt. Must be included with the total transaction. In other words, the receipt must split out the amount, but only one transaction is sent. Added only to a domestic Unattended Transaction. In other words, they self-pay. Must be disclosed to customers as a charge for alternate payment channel convenience. How much is allowed for a convenience fee? Per Visa, the convenience fee must be a flat, or fixed amount, regardless of the value of the payment due. There isn’t a limit on the amount and a merchant may choose to dynamically generate the convenience fee amount. Regardless, the consumer must be able to opt-out prior to completing the transaction. See Visa Core Rules Table 5-7: Convenience Fee Requirements for more information. MasterCard surcharge and convenience rules June 28, 2018. Please share your convenience fee insights for others and ask any questions below. Free credit card transaction fees checkup includes self-assessment, no merchant statement sharing with third party required. Due to massive changes in card network rules over the last two years, a review is essential. This method is easier than my B2B credit card processing fact check, while still revealing problems that must be resolved. As a processor neutral payments expert, Christine Speedy offers a unique perspective. Here’s a shortcut to determine if you have authorization problems, which directly impact credit card transaction fees. Why is this important? Because unless you fix the underlying problem, switching merchant accounts will only provide partial relief from escalating transaction fees like the new MasterCard .25% misuse of authorization fee. If you have any of these items below on your merchant statement, you have a problem. Most likely it’s a payment gateway issue. Hint: If you open your merchant statement in Adobe Acrobat, in OSX with command F you can copy and paste the terms above. It’s not foolproof due to varying abbreviations, but you only need to have one of the bad items to know there’s a problem. I don’t know why, but I get calls from other salespeople in the industry looking for solutions to help customers qualify for Data Rate II. Why wouldn’t you want the customer to qualify at Data Rate III? Makes no sense. I also hear from merchants how they were told that the new solution would fix their level 3 data problems, but it didn’t. If you do preauthorizations, and the solution doesn’t automatically get new authorizations and manage reversals it’s not going to fix authorization problems. Always ask, “how will the payment gateway manage authorization reversals if we don’t settle for the original preauthorization amount’? That’s one of several critical key questions. If they don’t know the answer instantly, move on. Due to massive changes in card network rules and data security compliance rules over the last two years, a review by a neutral payments expert is essential. Did you have any red items? It’s time for a deeper dive into why. Your FREE report will identify issues impacting profits and security, include action items how to fix them, and rarely requires changing financial partners. Click to download FREE credit card transaction checkup form. Your FREE report will identify issues impacting profits and security, include action items how to fix them, and won’t require changing financial partners (in most cases). Call Christine Speedy, PCI Council QIR certified, to reduce merchant fees with new or existing merchant account at 954-942-0483, 9-5 ET. CenPOS authorized reseller based out of South Florida and NY. CenPOS is an integrated commerce technology platform driving innovative, omnichannel solutions tailored to meet a merchant’s market needs. Providing a single point of integration, the CenPOS platform combines payment, commerce and value-added functionality enabling merchants to transform their commerce experience, eliminate the need to manage complex integrations, reduce the burden of accepting payments and create deeper customer relationships.